While I was away, a new paper was published in the journal Nature on astrometric measurements of Io's orbit, looking at changes of that orbit (as well as Ganymede and Europa) over a period of 116 years, the number of years covered by the observations used. This paper is authored by Valéry Lainey, Jean-Eudes Arlot, Özgür Karatekin, and Tim Van Hoolst and is titled "Strong tidal dissipation in Io and Jupiter from astrometric observations." The authors "numerically integrated the full equations of motion for the three satellites' center of mass" and fitted their model to astronomical observations of the Jupiter system acquired between 1891 and 2003. This allowed them to more accurately determine long-period terms in the interaction between the three satellites and Jupiter. For example, one goal of these types of models is to determine whether these three satellites are moving away or toward Jupiter. In other words, are the periods and semi-major axes of these satellites' orbits increasing or decreasing? Previous models gave often drastically different results based on fewer observations. Using this longer time-span of astrometric observations and fitting for the rate of tidal dissipation within Io and Jupiter, Lainey et al. determined that Io is slowly spirally in toward Jupiter (decrease of 55 kilometers in the semi-major axis of Io's orbit in 116 years), while Europa and Ganymede are spirally outward from Jupiter (an increase of 125 km and 365 km, respectively). This change in the orbital and rotational periods of these satellites shows that Io, Europa, and Ganymede are slowly leaving a state of Laplace Resonance, where Europa's orbital period is twice that of Io and Ganymede's is four times that of Io. It is this resonance that helps prevent Io's orbit from circularizing. Because Io's orbit is eccentric (non-circular), the gravitational pull of the tidal bulge Io creates on Jupiter varies depending on the position of Io in its orbit. This varying gravitational pull causes friction within Io's interior, which is dissipated as heat. If Europa and Ganymede's orbits increase in size and Io's orbit decreases in size, then eventually this resonance will be broken. Once this happens, Io's orbit will slowly circularize and reduce the amount of tidal energy that is dissipated as heat, causing Io to become dormant. While much of this part of the paper has been discussed quite a bit in the popular press (see articles from Ars Technica and New Scientist), another result from Lainey et al. is that the current rate of tidal dissipation is consistent with estimates of Io's global heat flow. Previously, it was suspected that Io was emitting more heat that was supported by the current tidal dissipation rate, suggesting that Io's interior was being heated up more in the past and it is now cooling down from that more intense period of tidal heating. Another theory suggested that the Laplace resonance between Io, Europa, and Ganymede goes through a cycles extreme tidal heating and dormancy. With the rate of tidal heating and the global heat flow being consistent with each other, such non-steady state heating models are not needed. However, as noted earlier, it still looks like these three satellites are slowly moving out of exact resonance. It was not shown whether a cyclical resonance system might still be possible. Today, we went up to Los Alamos and Santa Fe. The ride up allowed us to see quite a bit of rain, make the drive up a little boring, not being able to see as much out the window. Once we got up to Los Alamos, we visited the Bradbury Science Museum which had quite a bit of information on the Manhattan Project and the Nuclear Lab in Los Alamos plus other science projects being conducted in the town. We weren't completely prepared for 50 degree weather so we stopped at a nice diner in Los Alamos where I got some chili. We then went down to Santa Fe to see the State Capitol. The streets in Santa Fe, were laid out by someone who was clearly either drunk or high, or maybe both. They don't believe in the grid pattern in Santa Fe. We eventually did find the state capitol, where we spent 30 minutes or so touring the Senate and House galleries. Lots of art in the hallways. The drive back to Albuquerque was a lot better than the drive up to Santa Fe and Los Alamos. First, the skies had cleared a bit so we could actually see distant landmarks. Second, we passed by a very strong thunderstorm west of I-25 with some very strong downdrafts and heavy rainfall. Luckily, we did not get caught up in the rain, though we considered chasing the storm before we found out that there were no paved roads in the area west of I-25 between Albuquerque and Santa Fe. We are back in Albuquerque now, probably going to go to Waffle House for dinner. Tomorrow, we are going to start to head back to Tucson, but we will make a stop at the Very Large Array, a radio telescope array made famous in the movie Contact. Images I took today and other parts of my trip can be seen on my Facebook page. I will give another report tomorrow. In the mean time, check out the videos of the two Callisto eclipses that occurred earlier today in the southern trailing hemisphere of Io (just simulations, no actual telescope images). Computer Animation of the first of two total eclipses of the Sun by Jupiter's moon Callisto over the south polar region of Io on June 20, 2009. First half shows a view from 7,317 km above Io's southern trailing hemisphere. Second half zooms in on the sun from near Kurdalagon Patera showing the total eclipse. The animation runs from 04:10 to 04:56 UTC on June 20, 2009. Computer Animation of the second of two total eclipses of the Sun by Jupiter's moon Callisto over the south polar region of Io on June 20, 2009. First half shows a view from 7,317 km above Io's southern trailing hemisphere. Second half zooms in on the sun from near Svarog Patera showing the total eclipse. The animation runs from 08:40 to 09:20 UTC on June 20, 2009. 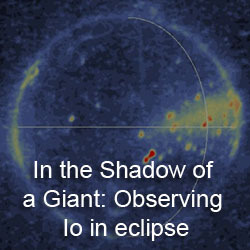 An earlier partial eclipse occurred on June 19 over Io's southern leading hemisphere as well. We pulled into Albuquerque a couple of hours ago after driving along I-40 from Holbrook, Arizona, where we stayed last night. The drive was supposed to be a straight drive with a few stops for gas, lunch, and snacks. However, we ended up stopping at the El Malpais National Monument, in Northwestern New Mexico, along I-40 west of Albuquerque. El Malpais is part of the Zuni-Bandera Flow field, an area of basaltic a'a and pahoehoe flows that erupted during the holocene and pleistocene, as recently as 3000 years before present. Very neat vistas, and don't worry, I got enough images to make a great panorama when I get home. I posted more images from this trip on my Facebook page which you all can check out. The image at left is me at a scenic overlook at El Malpais a few miles past the ranger station. I will post more there each day of the trip as well as when I get home. Today, my friends Roni, Audrey, and I drove up to Meteor Crater from Tucson. This was actually my first visit to this tiny impact crater, but certainly worth taking photos of. Tomorrow, we are going to head over to Albuquerque and later Los Alamos. We ended up holing up in Holbrook, Arizona for the night. Holbrook is a pretty small town, but the Italian Mesa Restaurant had some great food. I will post most of my pictures when I get back to Tucson Monday, but at right is a great shot of Meteor Crater that I took today. I also took quite a few images that can be used to make a huge panorama of the crater that I will put together when I get back home. 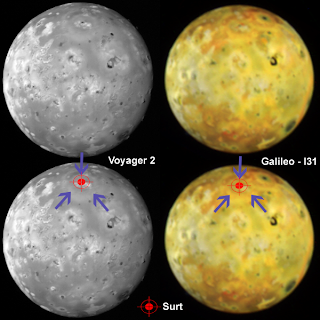 On June 11, 1979, astronomer William M. Sinton observed Io and the other Galilean satellites using an infrared photometer at the University of Hawaii's 2.2-meter telescope at the summit of Mauna Kea. These observations were made as part of a three-day campaign to confirm Io's excessive brightness at 5 microns observed by Witteborn et al. 1979 by making observations of Io and the other Galileans using the photometer's M filter. Sinton published the results of these observations in the Astrophysics Journal the next year. While Sinton's June 10 observations didn't reveal excessive emission from Io at 5 microns, his observations the next day revealed a nearly 4x increase in the near-infrared flux of Io compared to the previous day, an increase he attributed in another paper from 1980 to a vapor explosion on Io's sub-jovian hemisphere that unroofed a liquid sulfur lake with a surface temperature of 600 K. Currently, such an observation would be reinterpreted as the either the sudden breakup of the crust of a silicate lava lake or the high-flow rate effusive eruption. Based on cooling models created by Ashley Davies et al. in 2005, the 600 K reported by Sinton 1980 would represent lava that erupted onto the surface (or was unroofed by a lava lake overturn event) an average of six hours prior to the observation (though with a single wavelength, we probably can't even say that much as this is a brightness temperature). Keep in mind that the eruption was still likely ongoing, but with a small area of very hot and fresh lava near the vent (or flow front) and larger areas of cooler lava. As this eruption occurred between the two Voyager encounters in 1979, the location of the eruption could be surmised by looking for surface changes in the hemisphere. 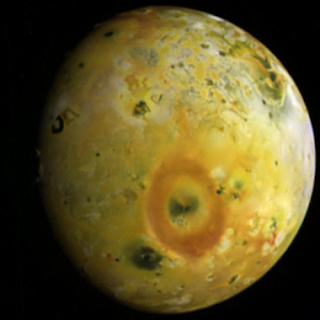 Looking at the region observed by Sinton on June 11, 1979, one surface change stands out, at the volcano Surt on Io's northern sub-Jupiter hemisphere. These changes, shown at left in the left-hand pair of images, included a darkening of the western half of the 75-kilometer wide Surt volcanic pit (shown above in an image taken by Voyager 1) and a faint, Pele-class plume deposit circling the volcano (marked by the purple arrows in the image at left). 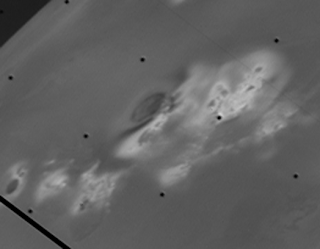 This suggests that the eruption at Surt in June 1979 involved a substantial outpouring of lava (or the violent overturning of an otherwise quiescent lava lake) and a Pele-type plume, the larger of the two primary plume types on Io. 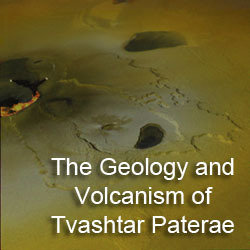 The fact that the plume deposit appears so faint compared to more prominent red rings seen at other Pele-type plumes like Pele, Tvashtar, and Dazhbog suggests either a low amount of sulfur and sulfur dioxide was exolved from the erupting magma or the eruption had a very short duration (a few days), or a combination of both. The rapid decay of Surt's 5-micron emission, as observed by Sinton, definitely suggests that the eruption was short-lived. Either way, very little sulfur and sulfur dioxide was deposited as a result of the 1979 Surt eruption compared to other eruptions with Pele-type plumes. Similar changes were observed at Surt following a bright eruption in February 2001 (the most powerful eruption in terms of power output ever observed), suggesting short duration and/or low volatile content eruptions are typical for Surt. The Surt eruption in 1979 was the first Ionian volcanic eruption to be observed from Earth following the phenomenon's discovery in March 1979 by Voyager 1. 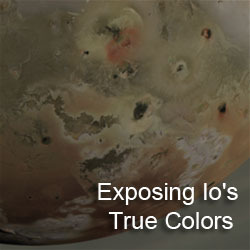 It showed that the occasionally near-infrared brightenings first reported shortly before the Voyager 1 encounter are the result of massive volcanic eruptions on Io and provided astronomers on Earth the encouragment to monitor Io for similar eruptions while scientists waited for the next spacecraft to arrive at Jupiter. Such observations during the 1980s provided the data needed for a paradigm shift from the idea of Ionian volcanism being primarily sulfurous in composition to primarily silicate. I had some spare time today so I finished up on creating proper PNG versions of two global color observations from I32, a Galileo flyby that took place in October 2001. I like to use PNG as it provides nice, lossless compression of image data without the compression artifacts often visible in JPEG images. These Io images already have compression artifacts from the on-board compression algorithms when they were taken, we don't need to be adding more. 32ISGLOCOL01 is the higher resolution observation (5.0 kilometers per pixel), but has more noise and compression artifacts, which reduces its effective resolution. This observation provides some color context for the regional observations acquired 11 hours earlier. The other observation, 32ISGLOCOL002 (shown at right) reveals terrain a little further to the west such as Loki and Dazhbog Patera (surrounded by a fading, half-circle plume deposit near upper left). I should note that in this version, I copied in some data from the green filter image to fill a gap in the south polar region in the red filter image. I think the result is pretty seemless, but I have also posted the non-gap fill version. Turning back to the present, astronomers around the world have been observing and posting on the internet, observations they've acquired of various mutual events involving the Galilean satellites, like Mike Salway's observation of Ganymede's May 25 occultation of Io I posted about yesterday. Hideo Einaga observed the same occulation, creating an animated gif of his data. Efrain Morales Rivera accomplished the same feat. Finally, Christopher Go observed an occultation of Io by Europa on May 31. With the Jupiter system approaching vernal equinox on June 22, eclipses of the Sun on Io by the other satellites in the Jupiter system and other mutual events (such as occultations, when one satellite passes in front of another from Earth's perspective) have been occurring for the last few months. Tonight, the first total eclipse of the Sun by Ganymede this mutual event season will take place. A partial eclipse by Ganymede also occurred just 30 minutes ago (another partial eclipse occurred on June 1 as well). Below are two animations created in Celestia showing these two eclipses. For more information, check out my blog post from December about the mutual event season as well as my 365 Days of Astronomy podcast from last month. Computer Animation of a partial eclipse of the Sun by Jupiter's moon Ganymede over the north polar region of Io on June 8, 2009. 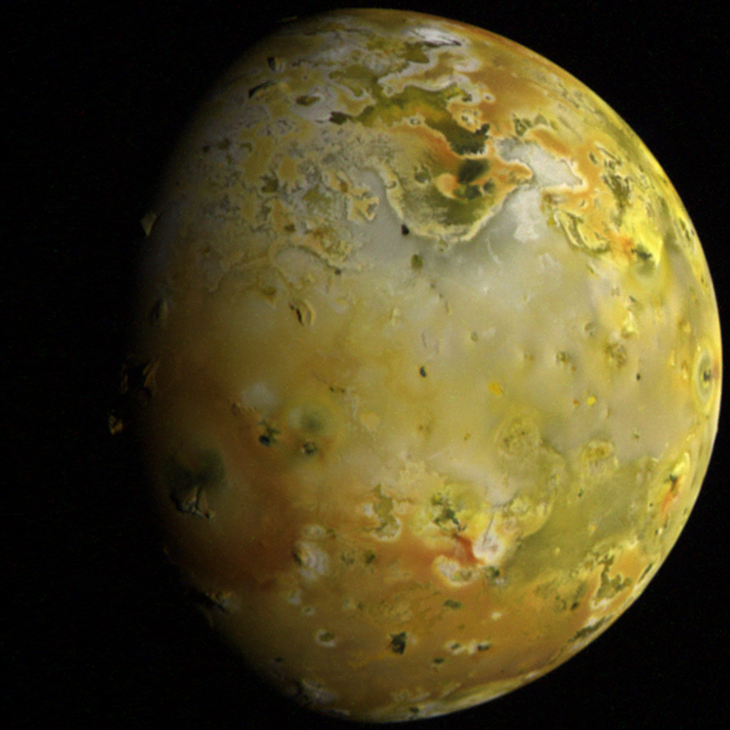 First half shows a view from 7,317 km above Io's northern leading hemisphere. Second half zooms in on the sun from near Io's north pole showing the partial eclipse. The animation runs from 20:38 to 21:08 UTC on June 8, 2009. Computer Animation of a total eclipse of the Sun by Jupiter's moon Ganymede over the north polar region of Io on June 9, 2009. First half shows a view from 7,317 km above Io's northern anti-jovian hemisphere. Second half zooms in on the sun from near the eastern end of Lei-Kung Fluctus showing the total eclipse. The animation runs from 09:30 to 10:15 UTC on June 9, 2009. These eclipses by Ganymede will occur every 8 days between now and mid-August with the most spectacular Ganymede eclipse occurring on July 15 when most of the trailing hemisphere of Io will be in the shadow of Ganymede.